Breakfast fritatta with mushrooms, Brussels sprouts and tomatoes is the ultimate idea for Mother's Day brunch. It will give everyone a hearty filling! 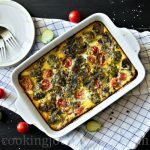 This baked frittata is a great dish to feed a whole family. Whisk eggs, then add milk and whisk together. Add cayenne, salt, pepper and leave aside. Cut mushrooms into slices, cut Brussels sprouts in half. Heat olive oil in a pan, add mushrooms, rosemary and tarragon. Keep stirring, for about 5 minutes until mushrooms are browned. Transfer cooked mushrooms with spices to the oven proof dish and distribute evenly. Return a pan to the heat and put in Brussels sprouts cut side down. Cook about 2 minutes until Brussels sprouts are slightly browned in the edges. Transfer Brussels sprouts in the dish along with mushrooms. Whisk again egg mixture and pour over mushrooms and Brussels sprouts. Cut cherry tomatoes in half and distribute on top of frittata. Sprinkle dried basil on top or add fresh one. Bake for about 50 minutes or until edges are browned and frittata is golden and set in the middle. * You can sprinkle some grated cheese on top and bake 5 minutes more until it melts. * Whisk eggs vigorously to have a fluffier frittata.